As a companion piece to Friday's post on the delights of simple knitting, I'd like to write today about complicated knitting. In whatever form that means to you. I'm not talking about Estonian lace, which might fall into the Complicated category for its complex stitches or its equally complex blocking requirements (or even its super tiny yarn knit on super tiny needles, which requires major manual dexterity on the part of any knitter not fully experienced with same). I'm talking about knitting that complicates your personal process. A stitch you don't enjoy working, or a yarn size that feels clumsy, or a fiber that seems to plot against you. The kind of knitting we avoid like it's plague's annoying cousin Melvin. Sometimes, you have to knit that stuff anyway, because it's what the end user wants, or because the sheer effort involved will make it more meaningful for them. And sometimes, you have to do it because it will make the end product better even though you really REALLY don't want to. Gah. 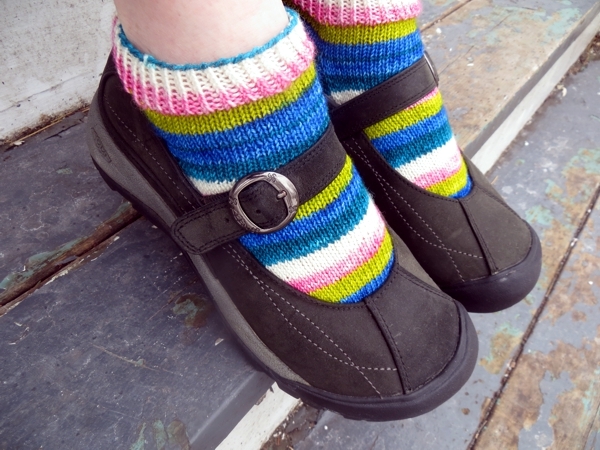 For example, I had an unwelcome inspiration when I started knitting a second pair of Socklits. I'm excited to have very short socks for this summer, because there are times even on a hot day when you need serious walking shoes and seriously good socks inside them. Making the legs short reduces heat retention where coverage isn't needed anyway, and it's a pretty fantastic thing that we knitters can dictate that sort of alteration by making our own socks. However, as you may recall - if not, this picture will surely remind you - my original pair did this sort of puffy outie thing at the cuff which I find unattractive in the extreme. Maybe if I was still a tiny girl it would be cute, but I'm getting a bit long in the tooth to go frolicking in ankle socks and Mary Janes as it is, and I think this looks pretty weird. Not enough for me to not wear the socklits, but enough that I didn't really want to knit another pair the same way. Even though the fix is So Tiresome. The thing is, I don't love knitting ribbing. I know it's useful, of course, but still - so boring! and so much back and forthing. I tried to learn continental knitting specifically because of how much I dislike knitting ribbing, but I found it made my carpal tunnel wrist issues flare up but good. 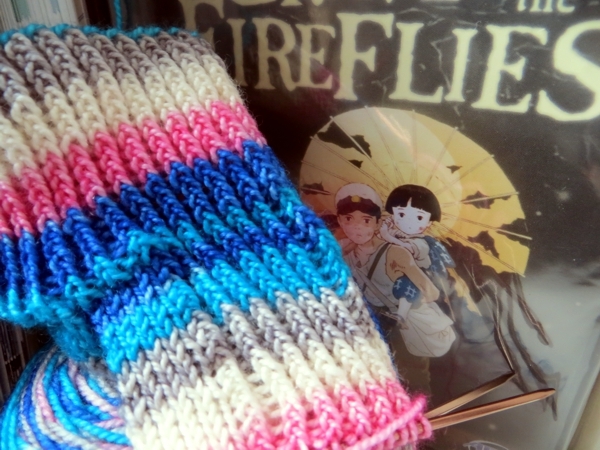 So under normal circumstances I avoid ribbing wherever possible, and celebrate when I finish a sock cuff and get on to the straight knit stitches that I can just fly through without thinking much. The only thing I don't love more than I don't love ribbing? Ribbing with the knit stitch done through the back loop. Technically it's not more work, but for some reason I have to think about that stitch every time, and it slows me down. 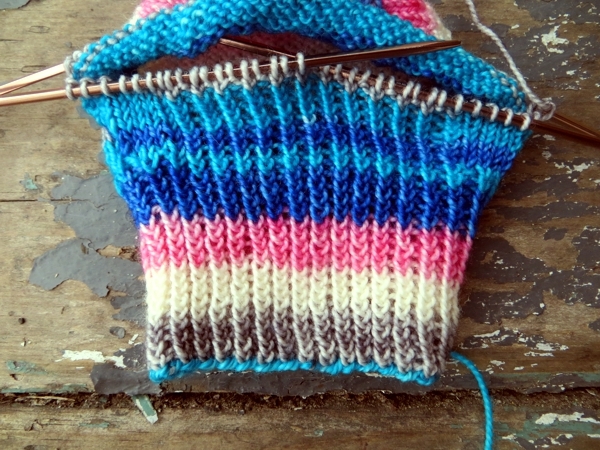 I only do it at all because it looks so much more elegant than regular knit-stitch ribbing, and in this case, I would have done the ribbing with plain knit stitches if I'd only had my inspiration before I'd done six or so rounds of the fancy kind on each sock. 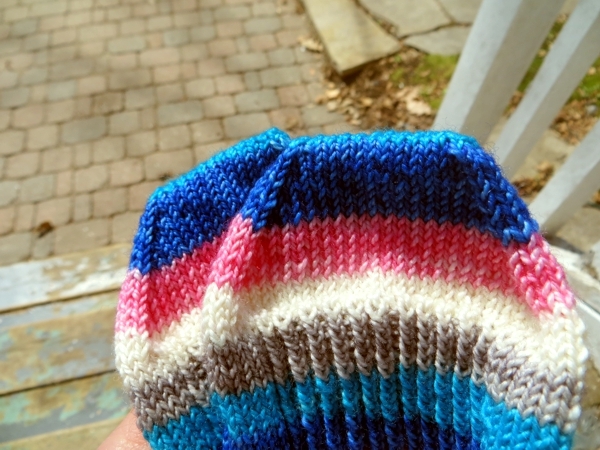 But it was logical to carry on the ribbing all the way to the heel flap, so I did. And then I went on with the ribbing after I'd finished the heel, leaving four plain knit stitches on other side of the ribbed central panel. 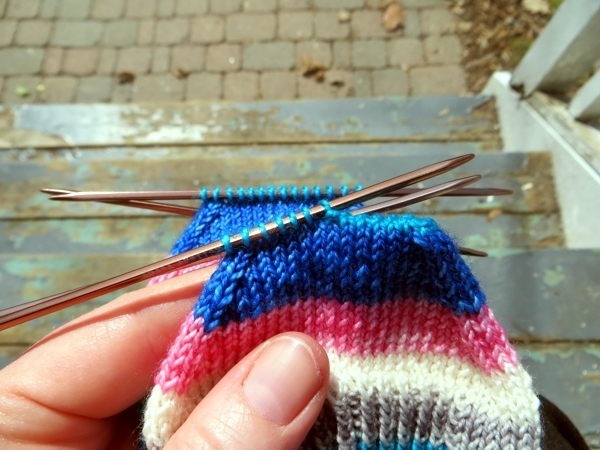 In a long-ago pair of ribbed socks, I used this trick and I felt it looked cleaner to keep the sides of the socks plain until they reach the top of the foot. Of course, having slogged through one sock to this point, where I could at least knit through the sides and sole of the sock, I had to get the other one there too. Oh look! how convenient, keeping it next to my computer. 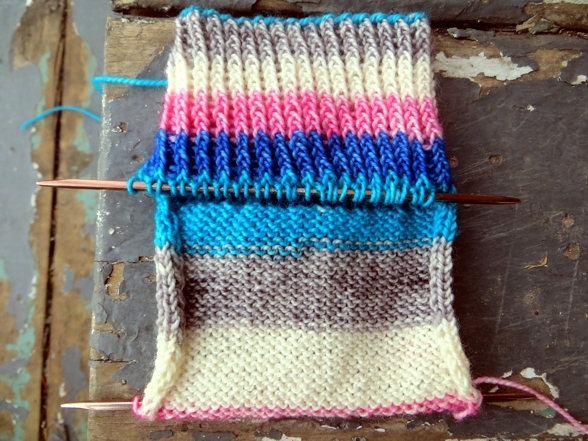 This is a sure fire way for me to make progress on a sock. And then too, these really are only socklits. The biggest effort goes into the foot, and then before you know it you're ready for a toe. I was tremendously grateful for the toes of these socks, because there's no problem with a puffy outie toe and I could revert to straight knitting. I even enjoyed the Kitchener stitch! And now they're done and I don't have to do that much ribbing ever again. I have one pair of Socklits I know I can wear on a walking day in summer when I really need to go blister-free, and who needs more than one good pair of socks you can wash a lot? Oh right... sock knitters. 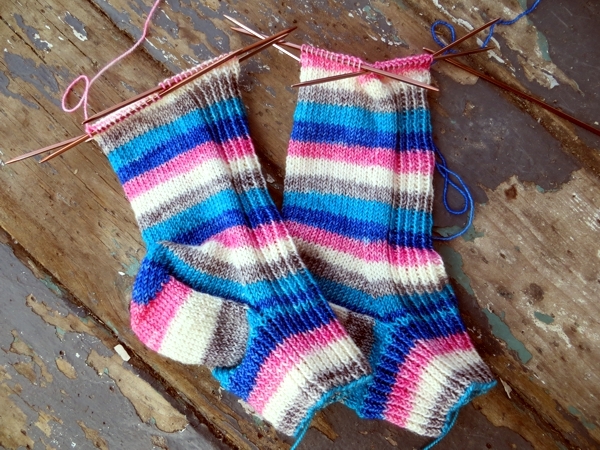 Sock knitters need more than one pair. And I do have the other half of each of the two existing pairs' yarn cakes that aren't useful for anything else anyway. Good thing there's so much virtue in complicated knitting, isn't it? I'll see you here again on Wednesday - tomorrow, I tweet! Take care of yourself in the meantime and if you do have to knit something you don't love, I hope it's in an especially good cause. Now, this is an incredibly good point Helena: normally I discount the turned picot hem, since it requires knitting twice as many rows, but I'm pretty sure 8 extra rounds is well worth the trade for a whole rest of the sock of no ribbing. Thanks! !